I failed to recognize that last Thursday was the 1-year anniversary of the “reboot” of my personal website. In that time, I’ve made a total of 134 posts, revived some old content I’d created a few years ago, and hopefully added something useful to the conversation. We’re certainly not setting any traffic records here, but my most popular pages continue to be the assorted installments of the Mini-Federalist, and – most surprising to me – my discussions of Civil War artillery, which get a fair number of hits from Google searches. It’s been fun so far. Thanks to all the regulars, and to all those who have just stopped by. Another of the sites at Hollywood Cemetery that I never posted about during my series at Gettysburg Daily was the grave of Bernadine Rees. 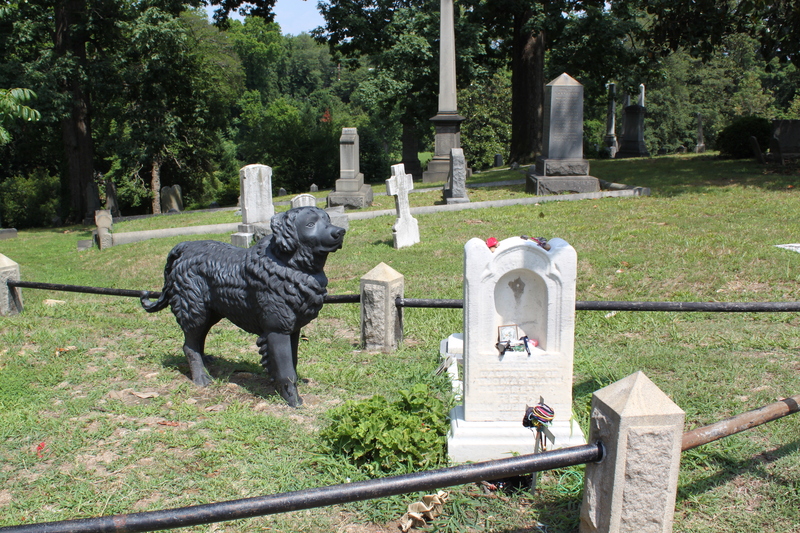 While not a famous Civil War figure – let alone a Gettysburg-related one – her grave is best known for the black iron dog watching over the plot. The loyal dog watching over the little girl. Photo by John Dolan. Ms. Rees died before she was even 3 years old – probably a victim of the 1862 Richmond scarlet fever epidemic. 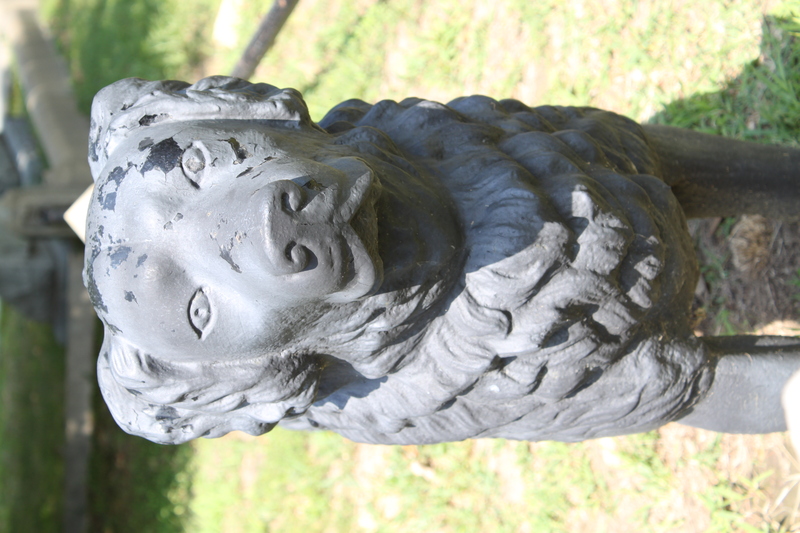 There a many stories associated with the statue of the dog. One is that it was a bought by the family especially for the plot (as Bernardine supposedly loved dogs). It’s also said that the dog statue belonged to a family friend who loved to see the little girl pat it whenever she came over, so he placed it next to her memorial. A head-on view of the Black Iron Dog. Photo by John Dolan. The dog makes for an odd curiosity to be sure, but there may be a Civil War connection, too. One of the stories is that the piece was a treasured object to the family (maybe because of Bernardine’s connection with it) and the family didn’t want it to be confiscated in a metal-hungry Confederacy in the midst of war. Not even the Confederate government would be desperate enough to turn to grave-robbing they thought, so they put the statue here for safe keeping. Whatever the truth happens to be, it’s a unique site for a number of reasons, and very popular with tourists to the cemetery. It’s become something of a tradition to leave toys and other gifts for Ms. Rees, and many of the visitors take part. The shape of the alcove in her headstone makes that a very tempting thing to do. Maybe it’s the dog, and maybe it’s the story of the death of a young child who never got a chance to grow up, but something about this place really seems to resonate with people. 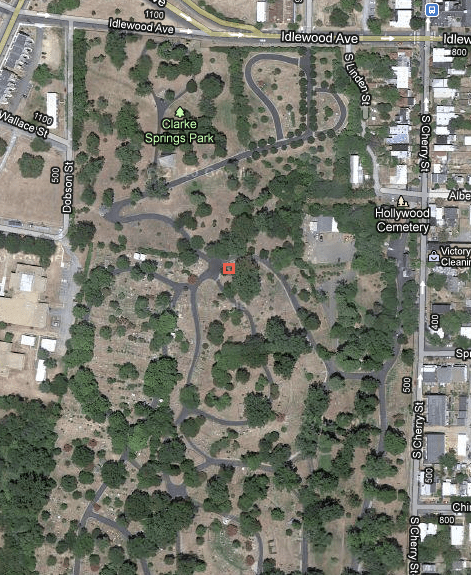 The grave of Ms. Rees – with the Black Iron Dog – can be found here. My speech in the video below repeats a lot of the information from above, but it also gives you a better idea of the scale, and a closer look at the kinds of trinkets people leave on the headstone. I know that it’s been a while since I’ve posted anything – I’ve now let life get in the way of three different series that I’ve started on here. For now, I can’t fix that, but I trust that I’ll come back to each of those in the near future. For today, I just wanted to make note of something I’ve noticed dozens of times, but haven’t really processed fully. I met a few of my wife’s family members down at Fort McHenry today for a tour. 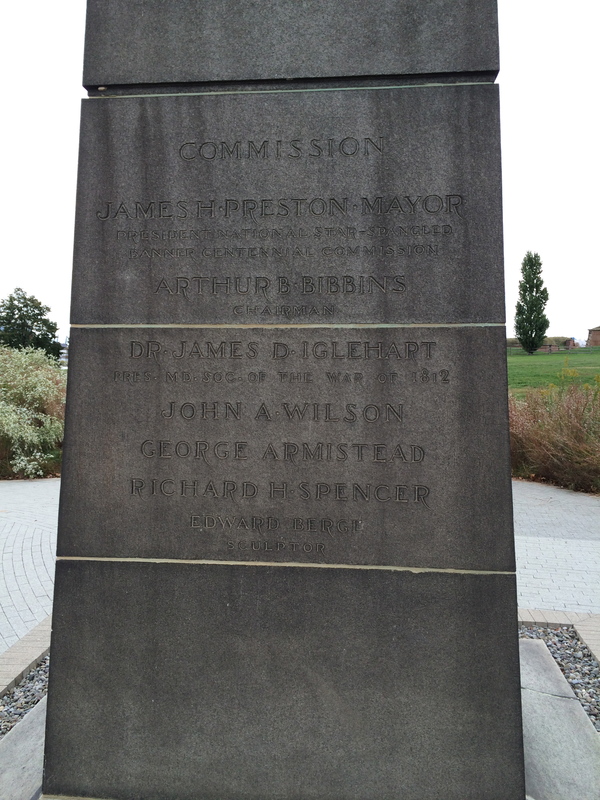 While I was waiting for them to arrive, I wandered over to the George Armistead Monument near the parking lot. The Monument to George Armistead. This is where the monument gets meta. There is more text on this monument that describes how, when, and by whom it was put in than there is to describe the thing it is actually memorializing. Like I said, I’ve seen this same type of thing on monuments dozens of times, and it always strikes me as being pretty narcissistic. As if the people who decided on the design and placement of the marker deserved equal praise and billing with the memorialized person or event! The thing is, this is some useful information in some ways. 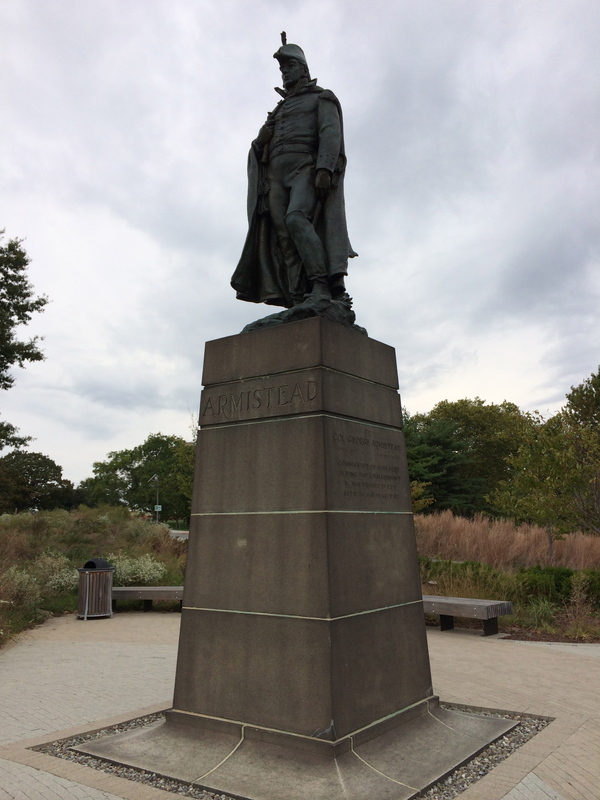 Who and what a people choose to memorialize can tell you something about those people – George Armistead was obviously enough of a hero in Baltimore in 1914 that this commission decided they needed a sculpture of him. And you don’t have to do any further research to discover who the sculptor was. 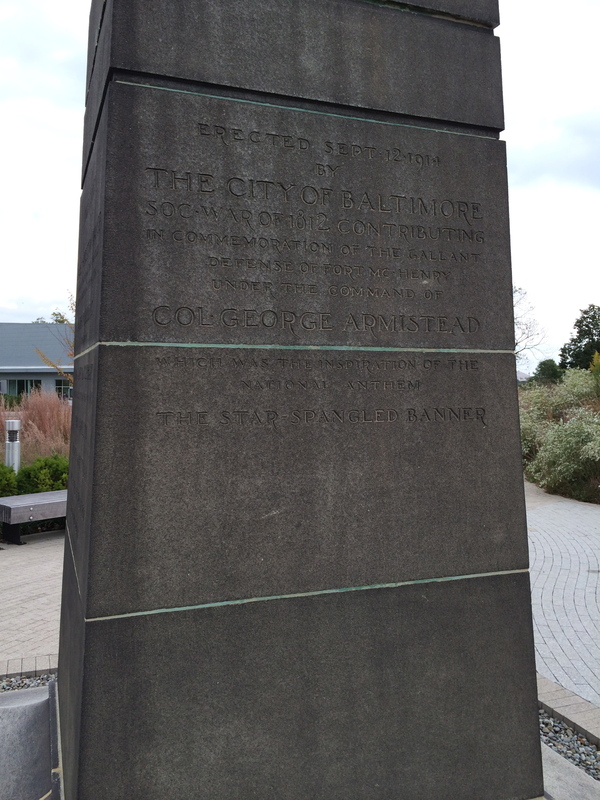 You can further infer that there was a big to-do made of the centennial celebrations of the Battle of Baltimore, what with a monument dedication and all. Maybe one of these commissioners was a relative of yours – a remote possibility to be sure, but something similar happened to my dad years ago at the Maryland Institute. I guess what I’m saying is that there’s a place or time when this kind of thing stops being the grandstanding of politicians and influential businessmen, and becomes “history” that is worthy of study. Not so much of the event itself, but of how the event is portrayed, and by whom. “Meta-history” if you will, but history nonetheless. Where is that line? I have a hard time deciding. 50 years? 100? A generation or two? Maybe when the day-to-day decisions of these politicians and notable citizens fade from our memory, and thus cease to have so much controversy associated with them? History is curved, after all. I suppose it’s up to the future viewers of the monuments to make that call for themselves. There may be some merit to exploring the backs of the monuments, too.